Eggplant Parmesan is a typical dish of Neapolitan cuisine, which is known and appreciated throughout Italy. It is a pie, almost a mess, made with a few simple and ingredients. So choose them carefully. The type of eggplant preferred, is the elongated one with the dark skin. They are more tasty even if they are more bitter. To solve this problem, after cutting into slices, put the eggplant in a colander layer by layer, each layer sprinkled with a handful of fine salt. 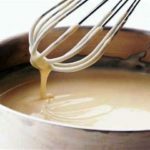 In this way they will lose their bitter liquid and will be excellent for preparing the dish. If you use this technique, once cooked they will not have to be salted. 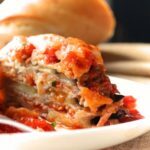 According to older generations, the sauce for eggplant Parmesan must be prepared exclusively with fresh tomatoes although we do have a wonderful San Marzano tomato (DOP) sauce for you to save some time. Fresh mozzarella doesn’t fair well in this dish as it will add to the liquid and the result will be too sloppy. Instead, use a dry-style mozzarella like the stuff you find grated in the supermarkets. The origin of this recipe is a little uncertain and more than one region claims its paternity. 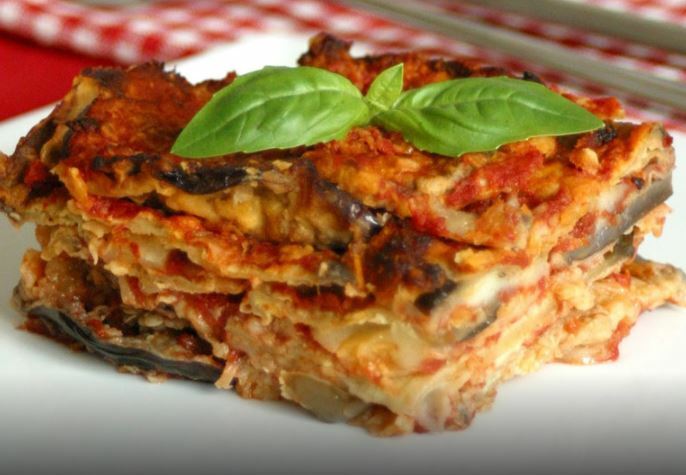 Emilia Romagna believes that the aubergine parmigiana owes its name to the city of origin and therefore to Parma. Sicily also claims its origin asserting that the long aubergines with which to prepare eggplant parmesan are typical of the island territory. Finally Campania, and more precisely the city of Ischia where, according to the bells, the first dish of dish of eggplant parmesan was served in the trattoria of the Pirozzi sisters. Prepare the sauce by putting the extra virgin olive oil in a non-stick pan to heat. Peel and finely chop the onion then add it to the oil. Let it cook over a very low heat until it is golden brown. Now add the Pasta Nosta San Marzano tomato sauce and let it cook to a boil, add the basil leaves after washing them thoroughly, check the seasoning and remove from the heat and set aside. If you are using fresh tomatoes for this recipe, you will need to keep them over a low heat for up to an hour until they thicken to a sauce. Pour the flour into a large shallow bowl and press each piece of eggplant into the flour covering them on both sides. Add some sunflower oil to a deep frying pan over a medium heat. Add the eggplant to the oil a few at a time and fry them until they are browned on both sides, topping up the oil as you work. As soon as fried, place them on a plate covered with absorbent paper and continue until all of the eggplant slices are done. In a baking pan used for lasagna, pour a ladle of tomato sauce spreading it evenly over the surface. Now add a layer of eggplant then mozzarella then sauce. Continue layering in this way finishing the top with sauce and finally the Parmesan cheese. Preheat the oven to 180C/350F. 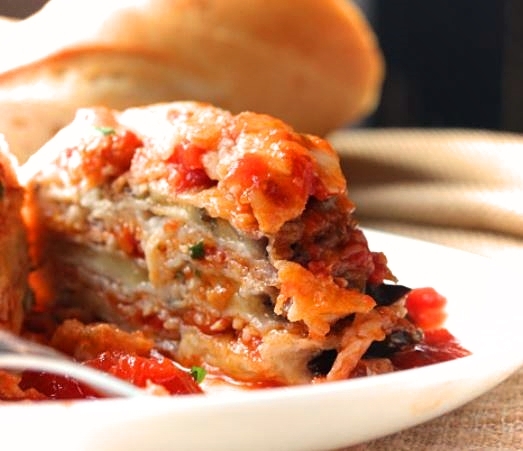 Place the eggplant Parmesan in the center of the oven and cook for up to 30 minutes. Remove from the oven and allow it to stand for up to 15 minutes during which time the eggplant Parmesan will set.